The Draft on Political Prisoners was prepared by the Parliament’s Human Rights and Civil Integration Committee and represented to the parliament for discussion on December 5. Based on the draft, 190 individuals will be granted the status of political prisoner and 25 will be recognized as persecuted on political grounds. Former Defense Minister of Georgia, Irakli Okruashvili was removed from the list. Okruashvili who had political asylum in France arrived in Georgia several days ago to prove his innocence. Currently, he is in custody and his case is being studied by the court. Zviad Kordzadze, the lawyer of Okruashvili emphasized that the former Defense Minister’s removal from the list should have been imposed due to “objective reasons.” According to him, Okruashvili was not going to use the status at all in case if it were granted to him. “Okruashvili arrived to prove his innocence through the court,” Kordzadze said. Majority representative, Koba Davitashvili, highlighted that he was against Okruashvili’s being within the list of the political prisoners. “He was the part of the previous government and lots of illegalities and repression had been carried out by him,” Davitashvili stated. 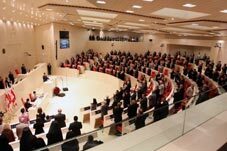 Those who will be granted the status of persecuted on political grounds include: Giorgi Kadagishvili, Genadi Archuadze,Bidzina Giorgobiani, Gela Naskidashvili, Mikheil Kareli, Iason Chikhladze, Levan Pkhakadze, Kibar Khalvashi, Niaz Khalvashi, Marine Chkonia, Badri Bitsadze, Zurab Giguashvili, Guram Gogua, Nika Gelashvili, Temur Gigashvili, Melik Raisian, Gocha Vetriakov, Davit Begiashvili, Ianik Karkusov, Jemal Karkusov, Tariel Khalvashi, Malkhaz Bablidze, Ilia Ramishvili, Teimuraz Shengelia and Gigla Baramidze. Those who will be granted the status of political prisoner are the participants of the May 26, 2011 rally which was brutally dispersed by the previous administration and the participants of some other well known cases such as the Mukhrovani military base rebellion and so on. Minority representatives will not support the document. Moreover, they started the meeting with several complaints. According to them, the new list of possible political prisoners was unknown to them and only 3 minutes before the parliament sitting were they given the lists. “It was practically unimaginable to familiarize myself with a list in such a short period of time… that list which was available for us earlier included such people that must not be taken as political prisoners and was written within the list as if they were the relatives or close persons of some officials,” minority representative, Chiora Taktakishvili said. Later Taktakishvili emphasized that the list is shameful and its confirmation will be a great shame for the country. Minority MP, Goka Gabashvili stated that the list is full of criminals and such a list should not have been composed at all. “There are such people in the list that have been accused in spying, rebellion, intent to murder and so on. Describing them as political prisoners is unjustified,” Gabashvili said. The minority claims that recognition of being a political prisoner in the country will pose a threat to Georgia’s international image. Political analyst, Ramaz Sakvarelidze does not share the view that the process might threaten Georgia’s international image. “The recognition of political prisoners might pose a threat to the previous government of Georgia and reveal past illegalities and more,” Sakvarelidze told The Messenger. “Moreover, it was public demand,” Sakvarelidze stated. Concerning Okruashvili, the analyst underscored that the he was a member of past unfair actions and he should answer for this. “However, there are some accusations which were really 'cooked' against Okruashvili. Those accusations should be removed and leaving him to answer for the real accusations set against him,” Sakvarelidze said.